Julia Reich of Stone Soup Creative is a branding consultant, graphic designer and graphic recorder, which is the drawing of ideas onto a large mural, in real time, during meetings and events. Julia brings extensive experience with a variety of visual brand innovation projects. She has a strong design, business, and leadership background having been in several senior design director roles, and for the past eighteen years as Principal of Stone Soup Creative. During her career she has participated in NY Designs, a unique design business incubator, was the winner of the 2009 Small Business Award from the Cayuga County NY Chamber of Commerce, and has been featured in several design books including Graphic Recycling and The Big Book of Green Design. Julia is committed to community service, with leadership positions in many organizations. She holds degrees from Pratt Institute and Hampshire College, and is currently pursuing a Masters of Fine Arts with a focus on Design Thinking and Visual Sense-making. 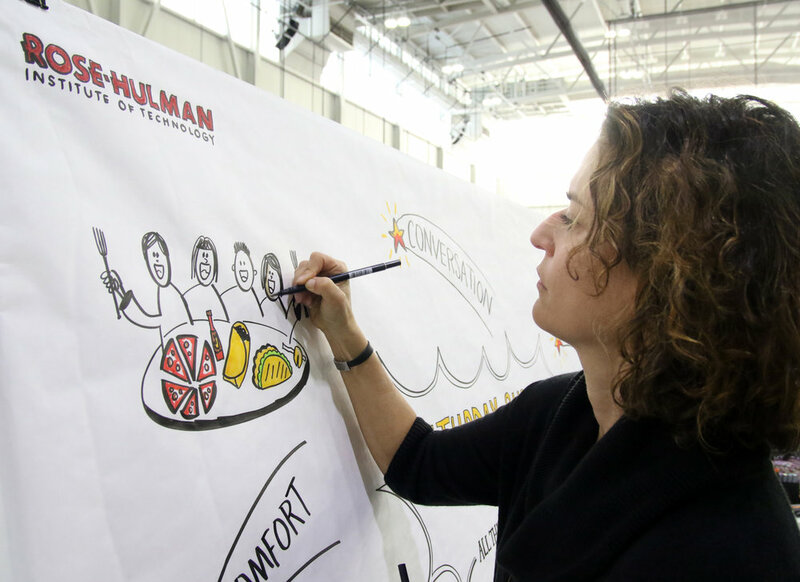 Julia states, "As a graphic recorder, I help conference and meeting leaders increase the value of their event with visuals. Since the majority of people are visual learners, incorporating drawings with information can increase memory retention up to 45%. Speakers talk while I stand at a giant board drawing pictures and writing out the key concepts and ideas - in real time. Now there is a visual summary of the content for attendees to reflect on in the moment, and for years to come. Clients tell me, "This group was more engaged than other groups we've had because people could see their ideas captured immediately on the poster!" Want to talk? I have ideas on how to incorporate visuals into your event and meeting development - to boost attendee engagement, and help people to literally see and remember what the participants and speakers said." "You were my hands down first choice to help us through all this. I remember the very valuable session you led—impressive to say the least. Your skill set to listen and craft a physical vision of how this might all work is invaluable"
"Thanks so much for the amazing graphic. The poster served as a rallying point for the groups coming together and you received rave reviews about it. Everyone appreciated the artistry of the graphic but more than that it became a reference point for cross sector communication. The Executive Director said it's the new "brand" for the collaborations and really sees it as a visual unifier for the project."